Notes: 1846 - 1964. 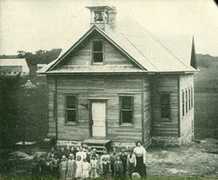 An early Torgerson School was established near the Ole Torgerson farm. In about 1853 fifty Norwegian families living in the valley east of Daleyville built the first school in the area. 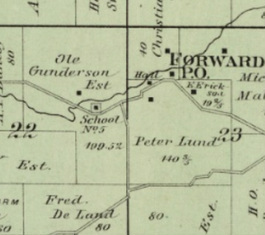 In 1871, when the federal government established a semi-weekly mail route in the area the first Postmaster named this area “Forward” and by 1875 the area had become prosperous enough to warrant a second, new school. In 1876 the Town of Perry bought the old school for use as a Town Hall. This building was later razed around 1895/6. The Wisconsin Power and Light Co. Forward sub-station is now located (approximately) on the site. By 1900 Forward had grown enough to warrant a third new school, this time with two-rooms. When the new school was built, the stone from the old school was used for a new barn on the P.V. Peterson farm. This school was located on the east-central edge Section 22. 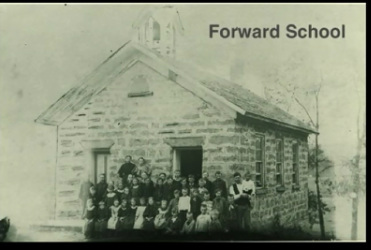 The 1900 school in Forward closed in 1964. Again, the Town of Perry bought the building for use as a Town Hall which it still uses today (2014) located at 10084 Highway A.